As the citrus crops in Florida get a week of record freezing temperatures – we are, in the midst of central Florida, trying to go south…and stay warm. It is obvious at this point, that I packed the wrong set of clothing for this trip. It’s also obvious, that this year — south means Brazil. Florida is not south enough. T-shirts and shorts? Forget that. 4-6 layers of everything I own is now the norm. With great pain, I unplug our 50 amp shore power at the Titusville Marina – and remove any last hope of heat for the next 3 hours. We can heat our salon only when at dock. Away from dock? It’s all about consuming hot tea, hot soup, and trying not to think about the numbness in your toes. Fortunately, the ICW trip from Titusville to Cape Canaveral FL is short. No fixed bridges to navigate under (whew! ), and every bascule bridge opened for us as we approached. At one point, the seagulls mistook our boat for a fishing vessel – and chased us for hours. This was the highlight of the trip – for Soxy. We plan to stay at Cape Marina in Cape Canaveral (and grab more heat) for the nite – and then depart offshore to Ft. Pierce the next day. Only 3 problems. 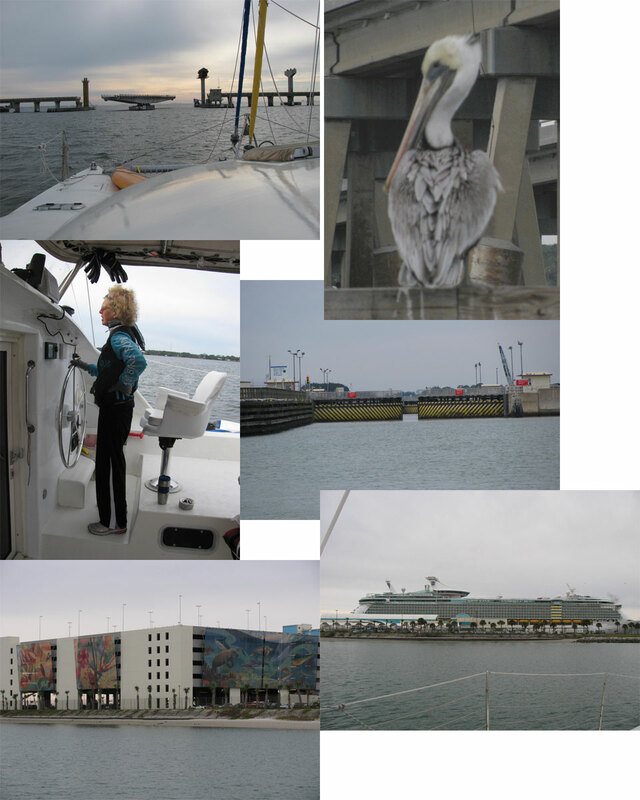 The sea state was looking a bit feisty, the temperatures would be in the low 30’s, and there was no marina availability in Ft Pierce. Apparently a sport fishermen tourney is happening — and all dock spaces are taken. Thus, we would have to anchor in Ft. Pierce with no heat. Ugh. After analyzing weather, wind direction, wave height, off shore buoys, temperatures, for hours – we decided to procrastinate the final offshore decision until the next morning. Maybe things would change? Maybe it would warm up? For now, we’ve reunited with Cat travel mates Rick & Linda (MakeItSo) in Cape Canaveral. Dinner plans were made for a nearby seafood restaurant called FishLips. A local Yachtie–Yachta friend of R&L (Maryanne) offered to drive. It appears that our most pressing dilemma, was to figure out how to fit 5 people in a mini-Cooper. It can be done!